The first seven blocks are done and the eighth is close to being finished. The circular effect that these blocks give is something I absolutely love. I can’t wait till they’re all done and I can lay them out and decide on placement. I got all the remaining fabrics printed. In just slightly over 2 hours I had all the fabrics ironed to freezer paper, printed and cut out. 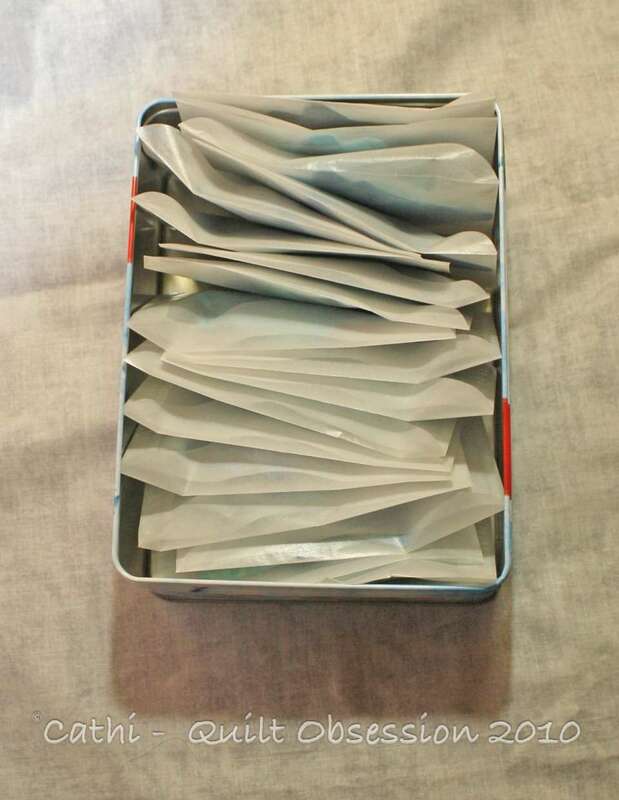 Then I started sorting them into glassine envelopes in sets for each block. This box has all the pieces for each of 17 or 18 blocks, ready to stitch. 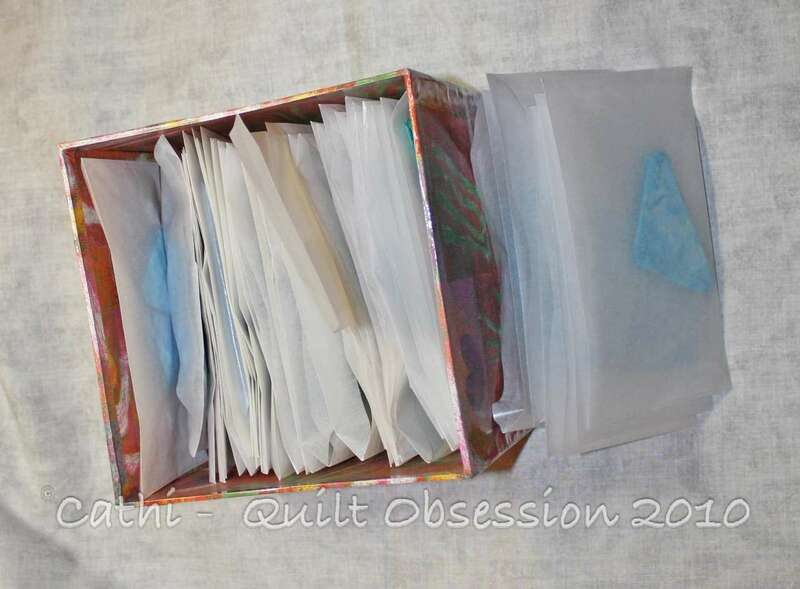 This box has the remaining pieces, all sorted in envelopes by fabric, ready to be pulled and put into block envelopes to join those in the first box. I love having lots ready to stitch like this. I wanted to get all the Storm at Sea shapes printed on the fabrics and ready to stitch before I somehow or another “borrowed” one of those fabrics for use in something else. Two of the fabrics I’ve picked for this are batiks with a slight dusting of a gold metallic that I think are going to look rather like light reflecting on the water. The best part of this is I know I won’t get bored making the blocks as each one will be slightly different. There will be 41 blocks to go once I get the current one finished. We’ve yet to do any decorating for Christmas. But our door decoration is up. 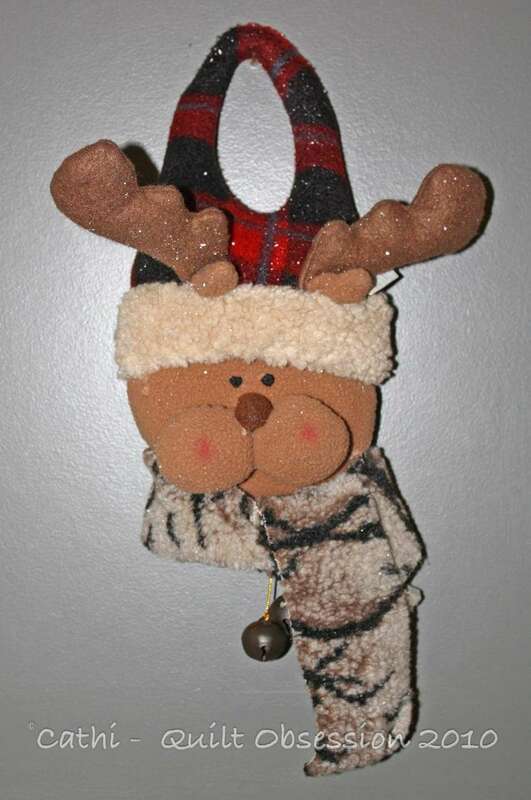 A few years ago we decided to find something that was a bit different than a formal wreath. I think we managed to definitely find that something different. The weekend was relatively mild, but we’ve had a real drop in temperatures that started overnight. While there was a lot of snow around us, the city once again didn’t seem to get any. I have a feeling the roads and sidewalks are slippery, though, as it rained on and off throughout Sunday and then the temperature dropped suddenly. Smudge definitely seems on the mend. Trying to figure out what he’ll eat on his own is becoming an adventure. What he likes today, he won’t like tomorrow. We’re fortunate in that he is still being quite cooperative with the syringe feeding. I can’t wait until tomorrow when we take him in to the vet. We can’t see any signs of jaundice now and I think he may have put on another pound. He was very lively on the weekend and even had one of his play fights with Lester. He also found a few spots to sprawl out and snooze. Lester was also in snooze mode a lot of the weekend. Love your Storm at Sea blocks!! I am so glad to hear Smudge is well on the way to recovery. Storm at Sea is looking fabulous!! You are really organized, but that definitely makes for quicker sewing. Great idea! It was very odd here this weekend. Lots of rain and 50 degrees. I kept thinking if all the rain had been snow we would have been shoveling for days. Glad that Smudge is doing better, I will look forward to hearing what the vet has to say! Good luck! Thank you for showing us how you organize your work. Neat! I like your door decoration far better than the usual wreath. I always associate wreaths with funerals. Smudge is looking so much better with all your loving care. Hope that continues. I haven’t done much decorating either yet, only outside, as I am afraid we have not escaped the snow, and it certainly is having a real blow this morning. You have made great progress with the Storm at Sea and am encouraging me to work on a batik project after Christmas. Still working on my two Christmas present quilts. Your organization is scarey! 🙂 No wonder you get so many projects done. Hmmmm… I better see what I can do in that manner! So glad Smudge is getting better and hope the vet has positive feedback! My 3 cats are inside for the long run. It’s 4 degrees this morning and we’ve had 40 mile an hour north winds which translates to wind chills of way too cold! Oooo I love seeing all the blocks lying together. This is going to be such a beautiful quilt!! So glad Smudge is on the mend, it will be a truly wonderful Christmas to relax and know he is well! Your system of printing and organizing your work is amazing! Hmmm, a stamp collector in your house? The glazene envelopes are a clever idea! Hugs and happy stitching! Those are looking so pretty, Cathi! You are so organized. I love that. So nice Cathi. You are inspiring me! I have some time off this weekend and may get the printing done for the rest of mine. I love your organization. I know what you mean about making sure you don’t steal the fabric for another project. I have done that a couple times. I’m glad Smudge is improving. A mock fight is a sure way to let Lester know things are OK.
BRRRRRRRRRRRrrrrr we’re freezing our babushkas off here in A — right now it’s -13C (windchill -23C) and windy/drifty/blustery. Pretty crappy! However, Smudge doing better is NOT crappy – it’s wondrous, and Z and I are very very happy to hear continuing good news – YAAAAAY! 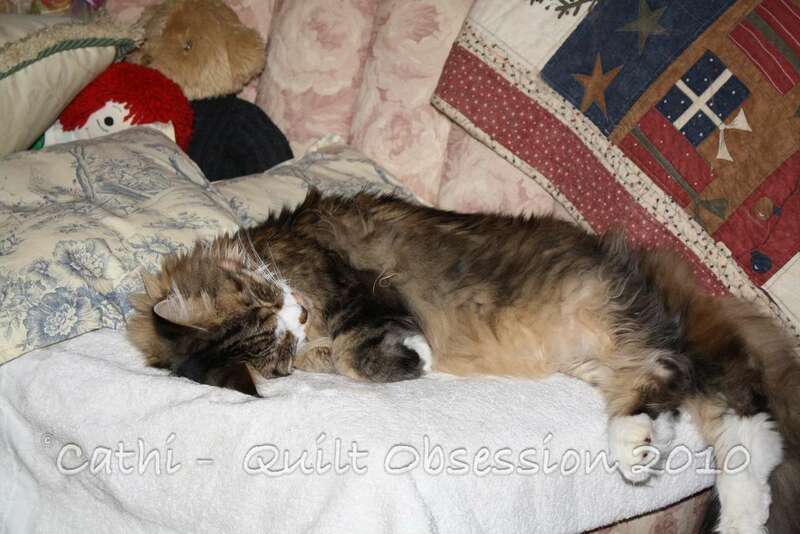 No doubt about those kitties, they know how to live in winter…..just lie around and conserve energy! 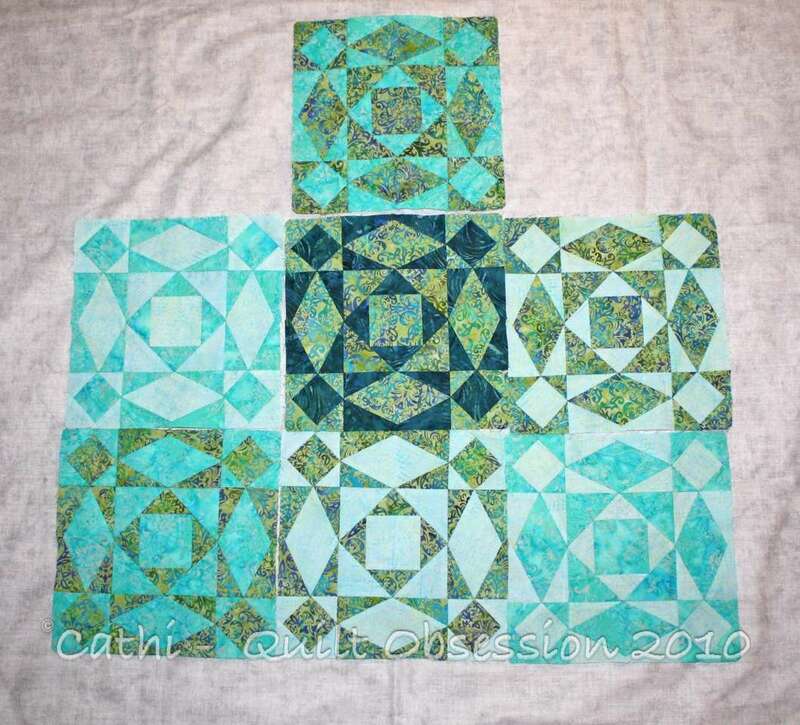 Love love love those blocks, it is going to be such a lovely quilt. And your door hanger is fun! What a pair of cutie pie snoozers! LOL! They look so comfy they make me want to find a place to curl up! I’m not sure if I can picture how the finished stormy seas is going to look….very warm here, all the snow has melted away with the heavy rain we had today :(. I love your storm at sea block, very pretty colours. Oh I LOVE the storm at sea blocks! (can you tell I am way behind on blog reading???!!) 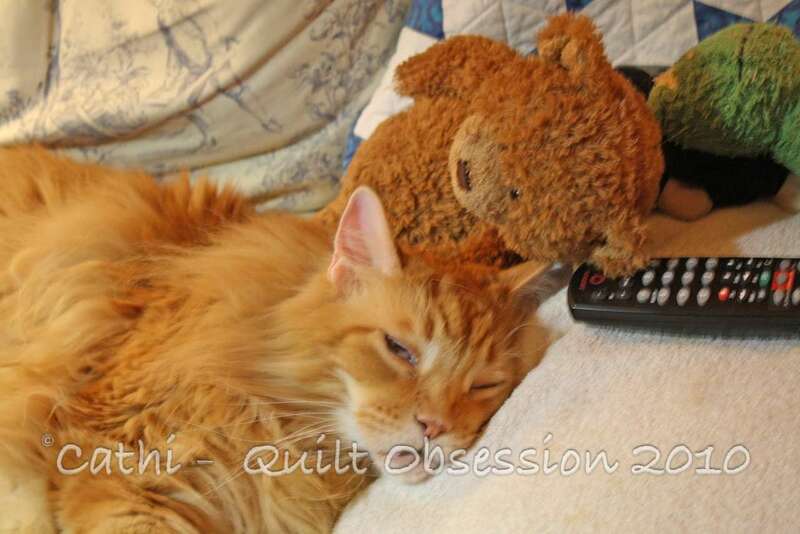 This is going to be another amazing quilt by you. Perfect watery colors!